The concept of Christian Perfection or Entire Sanctification is based upon our desire to overcome the corruption of this present world as it relates to our soul and spirit. And even though we may become perfected in God's love, spiritually, we may not be able to overcome the imperfection remaining in our physical bodies; however, perfect love prevents us from acting upon these lusts. "That is, unto those alone, exclusive of others, but they speak to them, jointly with others, almost continually." This footnote I consider to be just as potentially confusing as his original statement. What I believe Wesley is saying is that the New Testament Biblical writers were writing to believers (those who were justified) who were not wholly perfected in God's love (those who were wholly sanctified), but that they did not exclude those who were perfected in God's love. "More rarely, I allow, but yet in some places very frequently, strongly, and explicitly." In other words, Abram was justified as being righteous even though he was not wholly righteous, simply because he believed in the Lord. But as we know, Abraham didn't stop here. He continually sought to serve the Lord, and to mature in His perfect love. Abraham still made mistakes, but his heart was set upon doing the will of God. "Q. What, then, is the point where we divide? "A. It is this: Should we expect to be saved from all sin before the article of death? There can be a huge difference between expecting and desiring to be saved from all sin before death. If we conclude that we cannot expect ourselves to be freed from all sin before death, then we tend to give in to those sins that entice us, because we conclude we have no control over them. The fact is, we do have control over sin, if we have the desire to overcome sin with unconditional and perfect love. "Q. Is there any clear Scripture promise of this - that God will save us from all sin? "A. There is: 'He shall redeem Israel from all his sins' (Psalm 130:8). "This is more largely expressed in the prophecy of Ezekiel: 'Then will I sprinkle clean water upon you, and ye shall be clean; from all your filthiness and from all your idols will I cleanse you: I will also save you from all your uncleannesses' (36:25, 29). No promise can be more clear. And to this the apostle plainly refers in that exhortation: 'Having these promises, let us cleanse ourselves from all filthiness of flesh and spirit, perfecting holiness in the fear of God.' (2 Corinthians 7:1). Equally clear and express is that ancient promise: 'The Lord thy God will circumcise thy heart, and the heart of thy seed, to love the Lord thy God with all thy heart and with all thy soul' (Deuteronomy 30:6). This is the positive way of looking at overcoming sin: "By the power of God, I can overcome all sin." I believe that this is the emphasis of Scriptures quoted above. We are not to expect God simply to remove all sin from our lives, for we know that even our most sincere belief in the Lord does not remove all temptation, because we still live in a corrupt world. But the Lord can and does remove our desire for such sin, if we let Him. We are to expect that God will instill His perfect love within us, and because of this perfect love, we can overcome all sin, and not be affected by its temptations. Furthermore, because perfect love also triggers a perfect repentant attitude, one in which we are truly sorry for any mistakes we have made, God is faithful to forgive us and redeem us from all unrighteousness. But, in this present world, such redemption does not eliminate all temptation, though it does help us come closer to that time when it is eliminated. If we truly and wholly love God, we will desire only to do those things that are pleasing to God, and we will reject all other things. "A. There does, and that laid down in the plainest terms. So 1 John 3:8: 'For this purpose the Son of God was manifested, that He might destroy the works of the devil'; the works of the devil, without any imitation or restriction; but all sin is the work of the devil. Parallel to which is the assertion of Saint Paul: 'Christ loved the church, and gave Himself for it, that He might present it to Himself a glorious church, not having spot, or wrinkle, or any such thing, but that it might be holy and without blemish' (Ephesians 5:25-27). 31. "The second is this, "YOU SHALL LOVE YOUR NEIGHBOR AS YOURSELF.' There is no other commandment greater than these." If we desire this perfect love of God, and truly believe that He can instill within us such love, which is an integral part of truly loving God with all our heart, soul, mind, and strength, then we have the power to fulfill all of God's commandments without even trying, for we will do so naturally. "Q. Does the New Testament afford any further ground for expecting to be saved from all sin? (4) 'The very God of peace sanctify you wholly. And I pray God, your whole spirit, soul, and body may be preserved blameless unto the coming of our Lord Jesus Christ' (1 Thessalonians 5:23). (2) 'Thou shalt love the Lord thy God with all thy heart, and with all thy soul, and with all thy mind' (Matthew 22:37). But if the love of God fill all the heart, there can be no sin therein. "A. (1) From the very nature of a command, which is not given to the dead, but to the living. Therefore, 'Thou shalt love God with all thy heart,' cannot mean, Thou shalt do this when thou diest, but while thou livest. (a) 'The grace of God that bringeth salvation hath appeared to all men; teaching us that, having renounced ungodliness and worldly lusts, we should live soberly, righteously, and godly in this present world; looking for the glorious appearing of our Lord Jesus Christ, who gave Himself for us, that He might redeem us from all iniquity, and purify unto Himself a peculiar people, zealous of good works' (Titus 2:11-14). 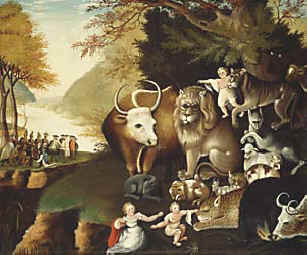 (b) 'He hath raised up a horn of salvation for us, to perform the mercy promised to our fathers; the oath which He sware to our father Abraham, that He would grant unto us that we, being delivered out of the hands of our enemies, should serve Him without fear, in holiness and righteousness before Him, all the days of our life' (Luke 1:69, etc.). "A. Yes; Saint John, and all those of whom he says, 'Herein is our love made perfect, that we may have boldness in the day of judgment; because, as He is, so are we in this world' (I John 4:17). For example, we may be tempted to participate in an ungodly act because we fear not being accepted by others. We would be excluded by them (punished), if we did not participate. But if we truly have God's love perfected in us, then we are not seduced by such fears. If such pressures are brought upon us, then we reject them as being unloving to both us and God. 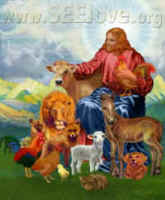 On the opposite side of the coin, we hear from people all the time, whose efforts and desire to achieve Christian perfection has led them to no longer eat or wear or otherwise use the tortured remains of animals; however, their churches continued in the sinful ways of the world including persecuting those who seek to be perfect, because they are no longer a part of their sinful group. "A. To some that make this inquiry, one might make answer: If I knew one here, I would not tell you; for you do not inquire out of love. You are like Herod; you only seek the young child to slay it. "Q. Are we not apt to have a secret distaste to any who say they are saved from all sin? "Q. Why may we not continue in the joy of faith till we are perfected in love? From these extracts it undeniably appears not only what was mine and my brother's judgment, but what was the judgment of all the preachers in connection with us, in the years 1744, 1745, 1746, and 1747. Nor do I remember that, in any one of these Conferences, we had one dissenting voice; but whatever doubts anyone had when we met, they were all removed before we parted. Yet today, I hear many dissenting voices within the clergy and from the congregations. The noisy clamor of their hearts is for "cheap grace" and not for Christian perfection. Many congregations survive on fear and forsake love, even though they proclaim it. Many spout the untruth that we are already in the image of God and fail to see the Fall or their own imperfections; or they cherish their imperfections and flippantly say that God will forgive them. We have fallen a great distance from our beginnings. It is time for us all to truly seek being conformed back into the perfect and sinless image of God, to seek Christian perfection and our own entire sanctification.